1 x waterslide decal sheet of national insignia, code letters, serial numbers and aircraft specific markings; 1 x A4 full-colour double-sided instruction sheet for seven aircraft. 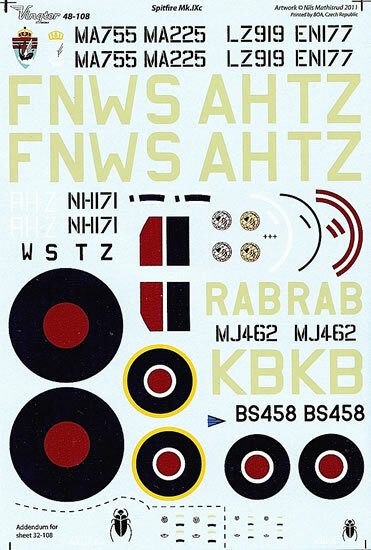 Interesting selection of aircraft; high-quality decals with comprehensive instructions; addendum on 1/48 sheet includes markings absent from 1/32 sheet. Blue and red of roundels on 1/32 sheet may be slightly too bright; four view drawings of each aircraft would have been nice. Two more great Norwegian-themed releases from Vingtor, which anyone considering a 1/32 Spitfire should take into account. These two nearly identical sheets from Norway’s Vingtor Decals feature seven Spitfire Mk.IXcs operated by the RAF’s 331 and 332 Squadrons and associated units in 1943-44. Norwegians made up most of the flight crew of these units, which flew against German targets from the United Kingdom and later France. Both squadrons were transferred to the Royal Norwegian Air Force at the end of World War 2 and remain operational today. While UK-based Spitfires from the mid-war period aren’t known for their flamboyant markings – all of the aircraft here are Dark Green and Ocean Grey over Medium Sea Grey, with Sky spinners and fuselage bands – Vingtor has chosen its subjects carefully, with most featuring something a little different from the norm. Spitfire Mk.IXc, FN-W/MA755, 331 Squadron, RAF North Weald, 1943. This aircraft featured a large, unapproved squadron badge on the port fuselage beneath the cockpit, and cannon fairings painted in the Norwegian national colours of red, white and blue. Spitfire Mk.IXc, KB/BS458, “Atschasikar”, flown by Wing Commander Kaj Birksted, North Weald Wing, RAF North Weald, 1943. This aircraft had a large beetle painted next to the name “Atschasikar” on the pilot’s entry door. Spitfire Mk.IXc, FN-S/MA225, 331 Squadron, RAF North Weald, 1943. For me this is the pick of the aircraft on these sheets, because in addition to red, white and blue cannon fairings it has black-and-white stripes on the upper and lower outboard sections of each wing, which nearly obliterate the RAF roundels. The stripes were applied because the aircraft provided support to Operation Starkey, a ‘dry run’ invasion of France in August/September 1943 that combined planning for a later, real invasion with a deception plan against the occupying Germans. 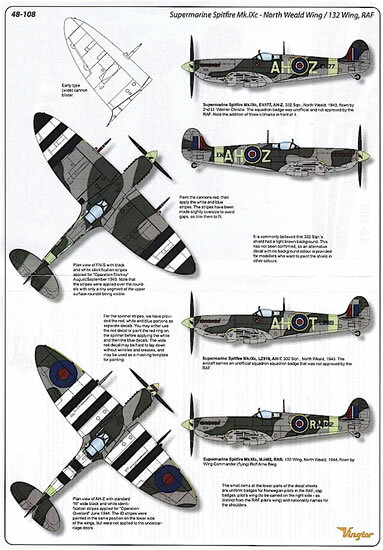 Any model finished in this scheme will definitely attract a second glance, not least because ‘real’ D-Day stripes are so distinctive and well-known that the Operation Starkey markings just look wrong! Spitfire Mk.IXc, AH-Z/NH171, flown by Second Lieutenant Werner Christie, 332 Squadron, Bognor Regis, 1944. Speaking of D-Day markings, this aircraft has a full suite of fuselage and wing stripes which were presumably applied at the last minute because they cover most of the serial number and squadron codes, with the latter crudely repainted on at least the port (and probably the starboard) fuselage side beneath the cockpit. The Norwegian national colours are again present, this time as a tricolor band around the spinner. Spitfire Mk.IXc, AH-Z/EN177, flown by Second Lieutenant Werner Christie, 332 Squadron, RAF North Weald, 1943. An earlier aircraft flown by the same pilot, this AH-Z featured more subdued markings, with an unofficial squadron badge beneath the cockpit its only distinguishing feature. Spitfire Mk.IXc, AH-T/LZ919, 332 Squadron, RAF North Weald, 1943. This aircraft carried the same unofficial badge on its port fuselage. Spitfire Mk.IXc, RAB/MJ462, flown by Wing Commander Rolf Arne Berg, 132 Wing, RAF North Weald, 1944. This was one of several Spitfires to carry Wing Commander Berg’s initials, which in this case were somewhat unusually overpainted by the serial number. Turning to the decals, both sheets are crisply printed with good colour registration and excellent detail in the squadron badges. The tricolor spinner and cannon bands are provided and will look great once applied – but careful work here will be essential, because no spares are provided, and I wouldn’t want to mess up the decal and then have to try to paint the bands. 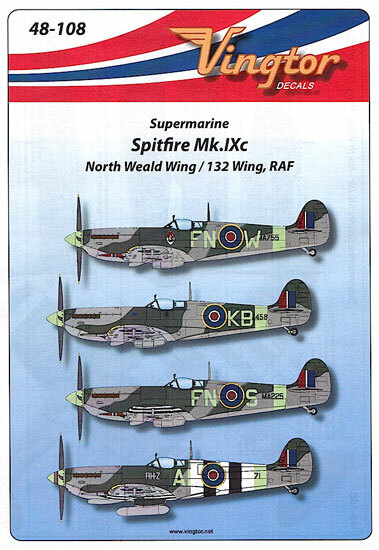 The instruction sheet is also excellent, with a detailed description of Spitfire variables – wheels, gun blisters, elevators etc – enabling modelers to accurately depict their chosen aircraft. However, four view drawings of each aircraft would have been welcome, as opposed to port profiles only (apart from EN177, for which a starboard profile is also provided) and overhead views of MA225 and NH171. There are several differences between the decal sheets, even though they feature the same aircraft. The 1/32 sheet, which was released first, has slightly brighter blues and reds than the 1/48 sheet; I prefer the darker tones of the latter, but concede it’s a personal choice. More interesting is the fact that the 1/48 sheet benefits from information that Vingtor didn’t have when it released the 1/32 sheet – specifically the picture of the beetle and the name “Atschasikar” on BS458, which are absent from the larger scale sheet. However, Vingtor has thoughtfully included 1/32 decals of these markings in a clearly-marked marked addendum on the 1/48 sheet; while it means that you have to buy the 1/48 sheet if you want to do an accurate BS458 in 1/32, it’s better than not having the markings available at all. 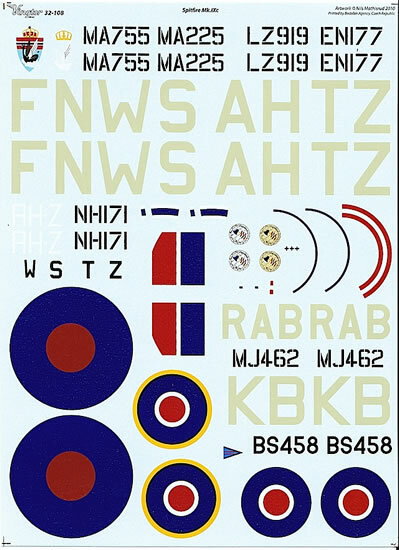 Also included on the 1/48 sheet, in both 1/48 and 1/32, are a selection of Norwegian uniform badge decals for modelers planning to create a diorama around their Spitfire. These sheets are more excellent Norwegian-themed subjects from Vingtor, and should be considered by any modeler looking for a scheme to dress up their large-scale Spitfire. Highly recommended.